To guarantee a stable, please prebook and prepay in full. To book, call Owen Nicholson on 0428 179 717. A designated area, which is signposted as such, has been set apart for electric fencing and/or tape. Competitors should ensure that where the power is switched ON, it is be clearly signposted as such. Champion and Reserve Ribbons will only be awarded when there are 3 or more horses entered in any section. Campdraft entries open on 22 October and close when all cattle allocated. Please include; name, phone number, membership number, event and horse name. The cattle competitions at the Dungog Show are some of the oldest competitions held at the Showground. They recognise the best of the best and reward the achievements of cattle breeders. The quality of animals is always high and competition is exciting. Cattle are placed in their class with the judges taking into account all the strengths and weaknesses of each animal. Their choice should be based on sound reasoning and the judge explains their reasoning when awarding prizes. Visit the cattle shed between 9.00am to 6.00pm daily, to talk with the breeder, fitters and handlers. Please Note MGBA does not hold Public Liability insurance at this time. Please also be aware that children under the age of 16 years must have a permission slip signed by a parent or guardian to handle animals in the ring on show day. MGBA show rules apply to every show and will be enforced. Enter on the day at High Jump in Main Arena. We're not entirely certain what the rules are in this class. Sometimes they are made up on the day, sometimes on the spot, sometimes they are broken, but whatever happens there are lots of laughs. There are black dogs, tan dogs, black and tan dogs, short haired, long haired, some in fancy dress, some in racing stripes but what they have in common is that they do their very best with their little legs to race to claim victory. Enter on the day at the race track in the Main Arena. Children of all ages are invited to show off their pet in one of our Show’s most treasured events – the Dungog Show Pet Parade! This colourful, crowd pleasing event is one of a kind and anything can happen. We hope that you will join us on Saturday at 10am. Children showcase their dogs and ponies, goats and calves, birds and fish, ferrets and felines in a Pet Parade that provides fun and entertainment for the entire family. Fancy dress for your pet is encouraged! Entrants are invited to walk in Grand Parade. 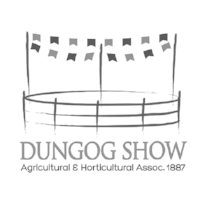 Entries are accepted on the understanding that competitors agree to compete under the articles of the association of the Dungog A&H Association Inc. and its By Laws and Regulations. Without the valuable support from Sponsors the Show classes would not be possible. The Dungog A&H Society gratefully acknowledge and thank them.